BREAKING: California Students Vote YES for Real Food, NO for Corporate Kickbacks! On May 6, students from the CSU and in the California State Student Association (CSSA) voted yes on a resolution for Real Food Systems in the CSU urging CSSA to support an increase in Real Food purchasing, to contest corporate food service kickbacks at 8 CSU campuses, and promote small student and community-based businesses. Real Food Purchasing: In 2014 the Cal State University (CSU) system approved a food service section in the Sustainability Policy ​that requires all 23 campuses to attain 20% Real Food by 2020 and track and report sustainable food purchases based in the ​Real Food Challenge guidelines​. Although this was an important step in encouraging changes in sustainability on CSU campuses it has mostly been led by student and dining champions with little to no support from the Office of the Chancellor or student governments. This resolution aims to change that. From recent audits the average ​Real Food percentage​ at the CSUs is ~5%. It is critical that this number increase to at least 20% as dictated by the CSU Sustainable Food Policy. Corporate food service kickbacks: Currently 8 CSU campuses outsource their dining operations to one of three companies that control 83% of the foodservice market. They are Chartwells, Sodexo, and Aramark. These companies are international multi billion dollar companies who receive kickbacks every year from big manufacturers in exchange for access to markets like the CSU. The resolution aims to bring attention and contest the practice of kickbacks at a public institution like the CSU. The resolution highlights the ways in which this practice brings expensive low quality food to the CSUs where many students already experience food insecurity. The resolution also references a legal precedent with K-12 schools where kickbacks were declared an illegal and corrupt practice and forced the companies to disclose all profits from kickbacks and return it to the school. This resolution can be an opening for such legal process at the CSUs. Promote small student and community based businesses: The resolution uplifts CSU students desire to see the system invest in agricultural programs and projects like UC schools such as UC Santa Cruz. It also urges for market relationships to be forged between student farms and gardens and community based farms and businesses. This resolution is bold, unprecedented, and widely supported beyond CSU stakeholders. Organizations that have supported the resolution include Farm Forward, Health Care Without Harm, and Food Chain Workers Alliance along with UC and CSU alums and have all written letters of support to the CSSA board urging a yes vote on the resolution. The resolution is sponsored by CSUMB student government with support from SFSU, Humboldt State and parts of it are already being implemented at CSU Long Beach, CSUN, Cal Poly Pomona, Chico State, CSU Fresno, and San Jose State. 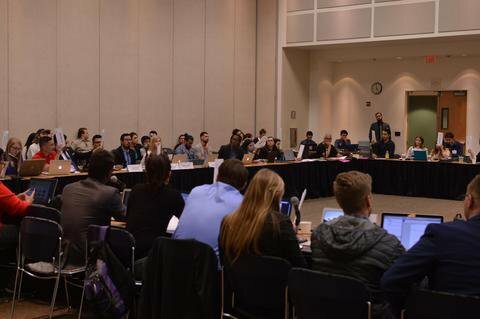 The passage of this resolution marks the beginning of the CSU system paralleling the UCs in many of its agricultural programs but going beyond with goals around Real Food purchasing and corporate scrutiny. The continued implementation of the goal to reach 20% Real Food by 2020 means a $25,000,000 investment by the CSUs in small and community based farms, fair work practices, humane treatment of animals, and ecologically sound agricultural practices.